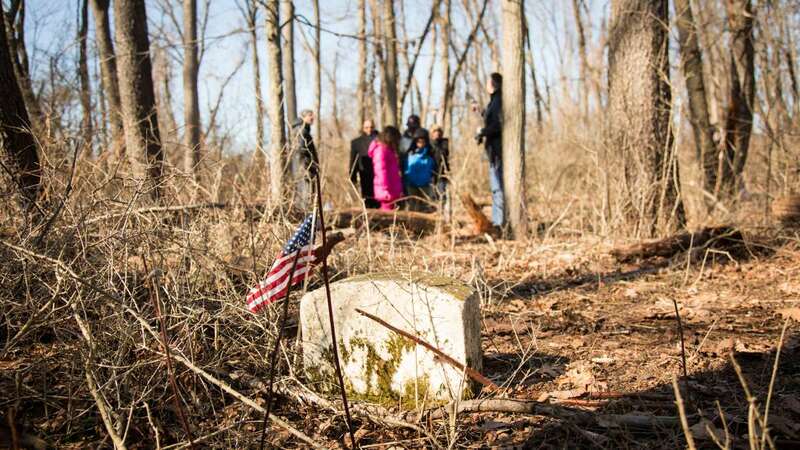 Tucked away in wooded no-man’s land between two planned communities in Chester County are the graves of an estimated 150 people, including 10 Civil War veterans who fought with US Colored Troops divisions. 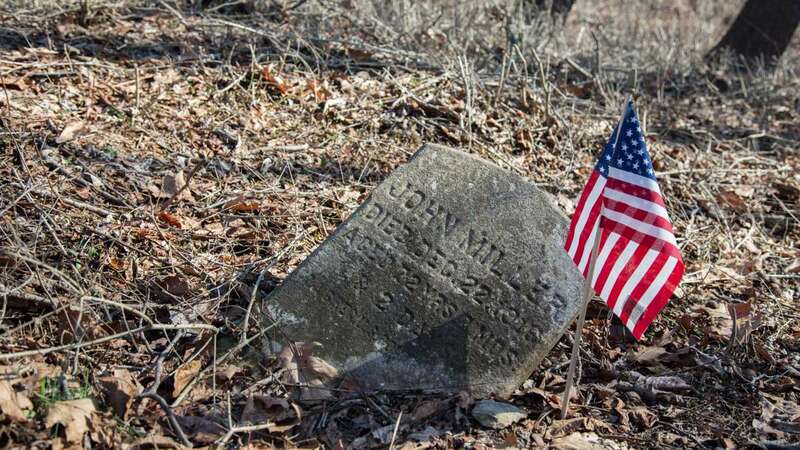 Sometimes called Derry Cemetery, after a nearby road, or Hutchinson UAME Cemetery, after the church that was once there, the burial ground is one of a half dozen neglected cemeteries in Chester County known to hold black Civil War veterans, local historians say. It’s also been the subject of several short-lived attempts to preserve the graves from encroaching development and the ravages of time. 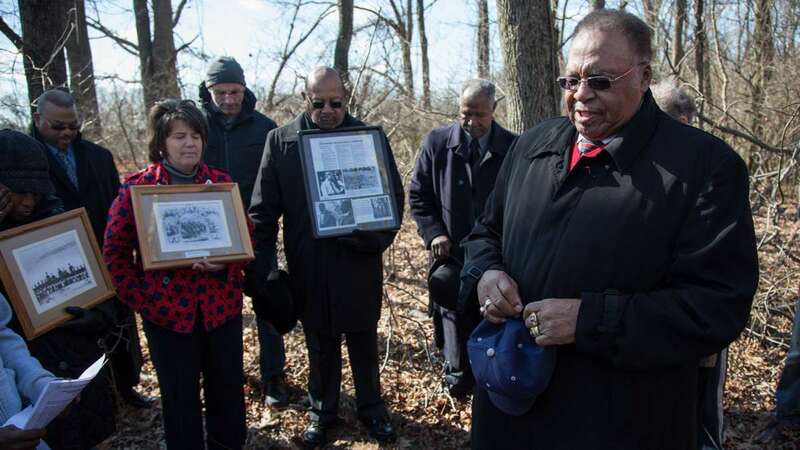 On a recent blustery morning, Coatesville resident James Jackson organized a commemoration ceremony and clean up, inviting political and religious leaders to come out to pay their respects. Standing among the slanted gravestones, officials at the state and local level promised to do their part to recognize the site and history of the people buried there. 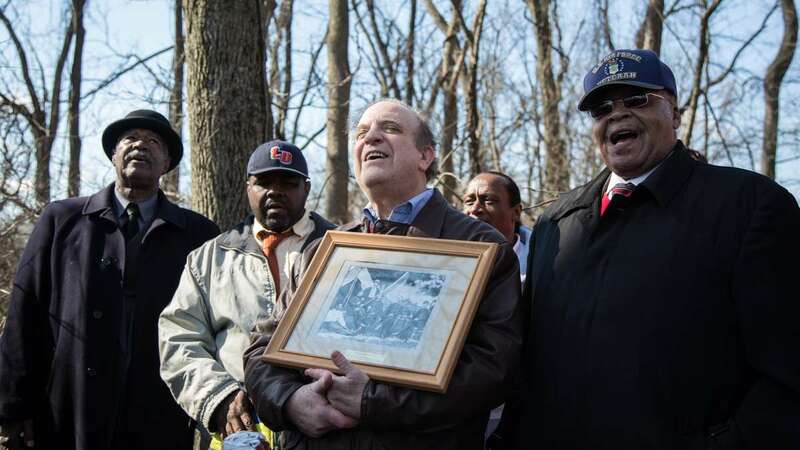 “We are going to resurrect this area, and we are going to do it amongst ourselves … to make this the sacred place it is and not just in the woods,” said state Rep. Harry Lewis. Jackson’s push to clean up the graves is just the latest in at least four efforts since 1981 to permanently protect the graves and provide for their continued upkeep. 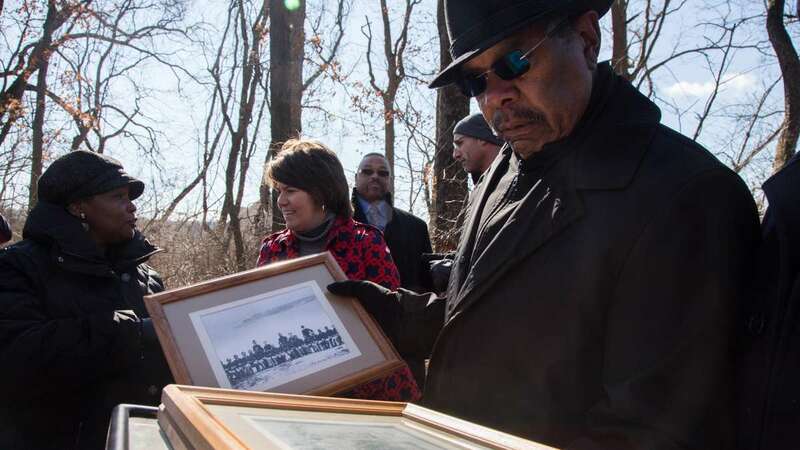 But the story of Derry Cemetery is a cautionary tale, illustrating that it takes more than promises to clear away dead leaves and preserve black history. In the mid-1980s, Pastor Robert Davis learned about the cemetery from one of his congregants at the Hutchinson UAME Church. The church had moved into Coatesville from East Fallowfield in 1909, and the old building burned down sometime later. Davis was eager to find the cemetery and put it back into use. He hoped his congregants, who were paying for plots in other cemeteries, could use one the church owned instead. But there was a problem. “I guess I didn’t realize even a graveyard has to pay the taxes,” he said. “So that’s why the property was no longer in our name.” The cemetery had been sold at sheriff’s sale in 1972 for $141. Davis wanted to buy it back, but eventually settled on a promise from the new owner to take care of the graves. He says that didn’t happen. “On my part, I didn’t follow through on that. I didn’t come out on a regular basis,” said Davis. Newspaper coverage of the cemetery and Davis’ attempts to fix it up also backfired, when looters used information in the articles to dig up some of the graves and steal Civil War buttons and badges. 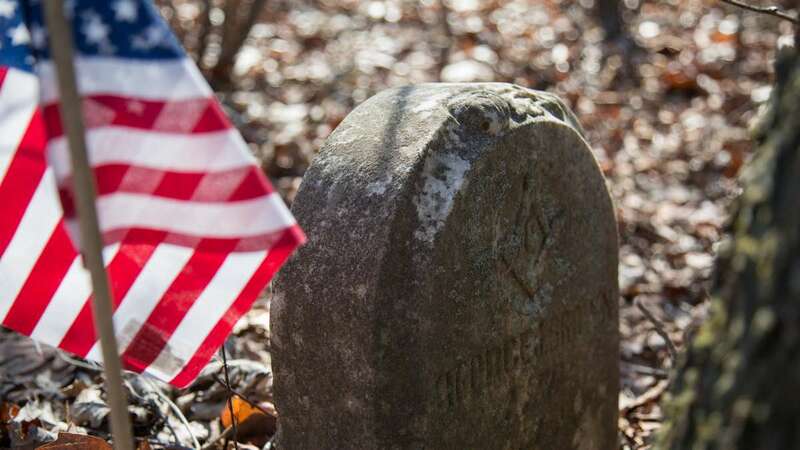 At other points over the last 30 years, historians and Eagle Scouts have made their own pushes to preserve the cemetery. 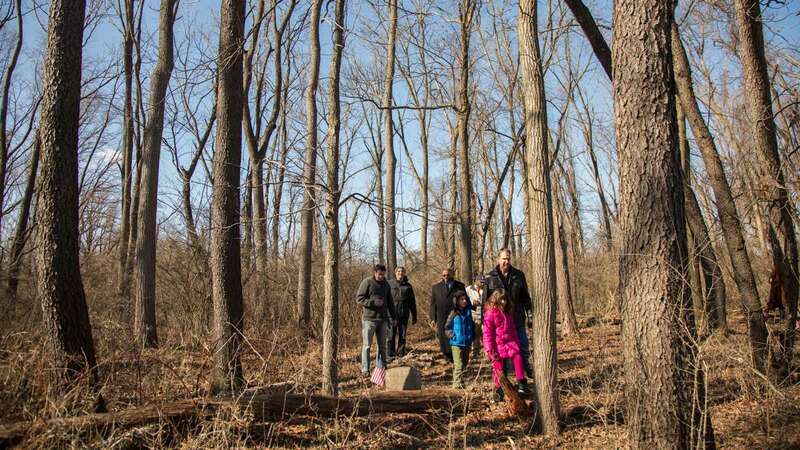 According to East Fallowfield Township, the land is now owned by Jonathan Nutt, one of the very people involved in an earlier preservation attempt. Nutt could not be reached for comment for this article. “Now to look and see, the graves are probably worse than they were then,” said Davis. Without owning the land, it can be hard to care for any neglected cemetery, historic or not. 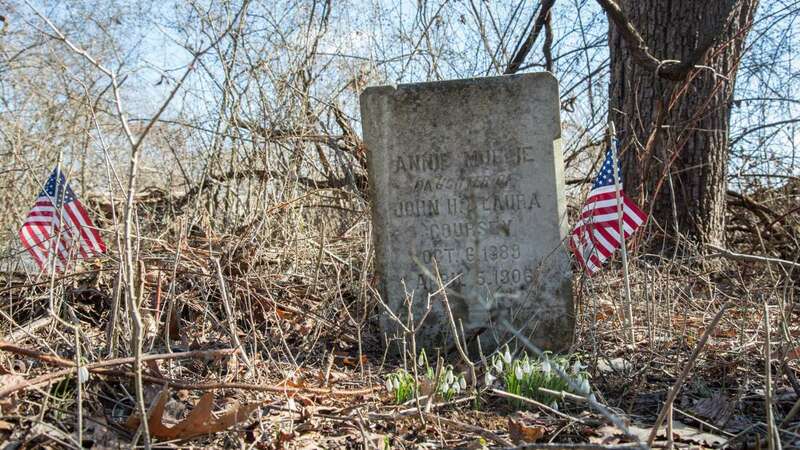 Laws about protecting graves vary by state, and Pennsylvania’s aren’t particularly helpful, according to historian Dan Lindley. The law is from 1923. 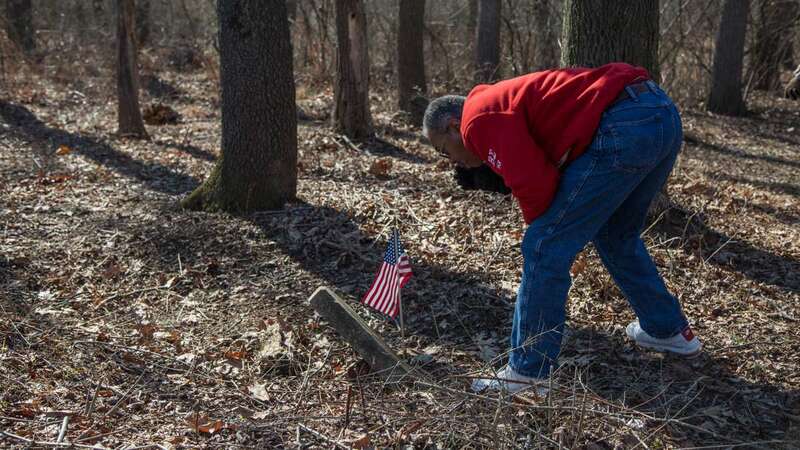 In Chester County, Lindley said it is more common for the graves of African-American Civil War veterans to fall into neglect. 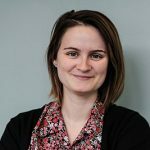 That trend bears out nationally, according to Lynn Rainville, an anthropological archaeologist at Sweet Briar College in Virginia, as segregation tended to divert resources and awareness away from black institutions. “Up until the 1960s, Jim Crow affected not just African-Americans in life but also in death in a lot of communities,” she said. 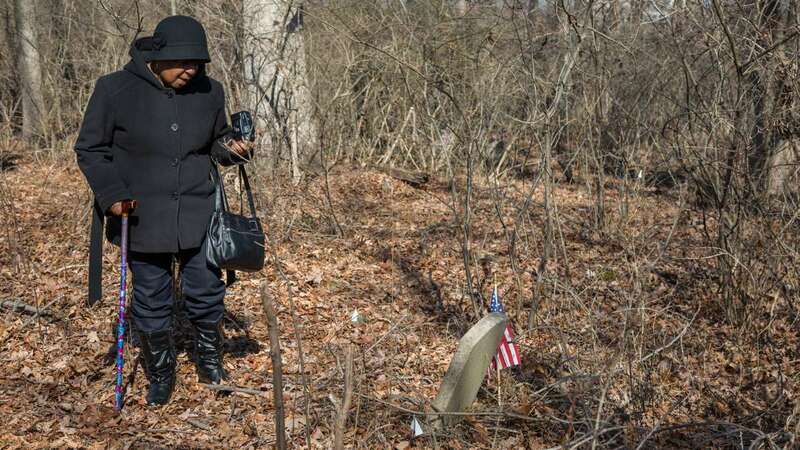 Even in public cemeteries, the graves of African-American were kept separate and in some cases were allowed to fall into disrepair, according to her research. 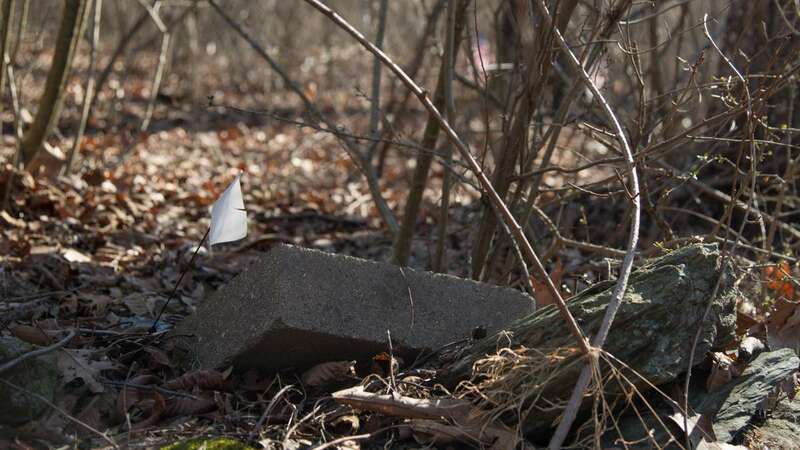 Another barrier to preserving cemeteries of the disenfranchised is a lack of documentation. As the case of the Derry Cemetery bears out, sometimes when people moved, the location of graves were not recorded in official documents. That can lead to a big surprise for later landowners. Perhaps the most famous example was the discovery of a slave cemetery containing more than 10,000 graves rediscovered in lower Manhattan in 1991. 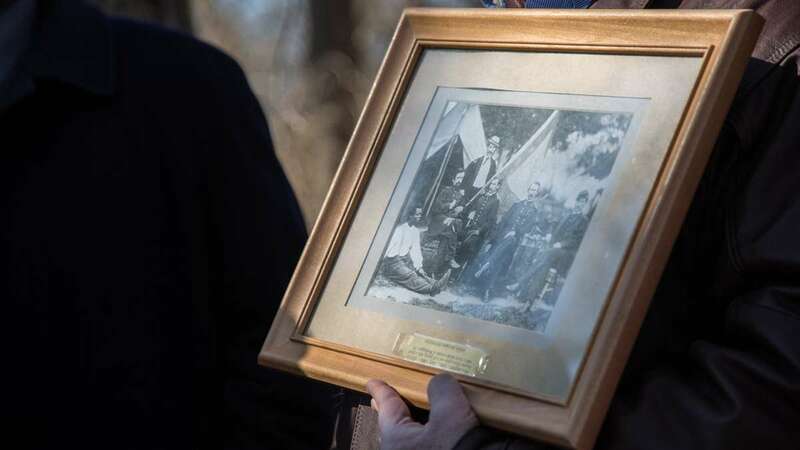 The federal government does provide funds for graves of veterans, and the Sons of Union Veterans of the Civil War tracks the location of and holds ceremonies for the graves of Union soldiers. In each case, a descendant of the deceased or a representative must request the service. When a neglected cemetery is preserved, typically a community group, church or township adopts the site. At the Derry Cemetery commemoration ceremony, representatives of local and state government reiterated their commitment to seeking a marker for the site and their support for keeping the area clean. 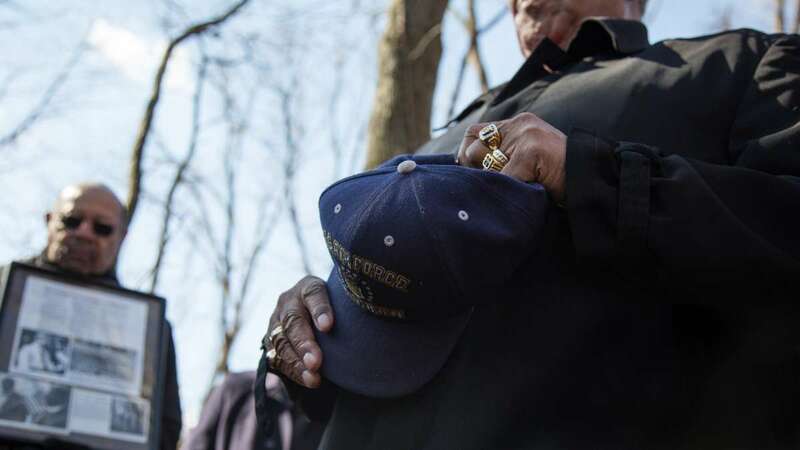 It was unclear what kinds of resource officials would commit to caring for the graves. Area residents have started visiting the cemetery again, and they’ve said they’ll give time and energy to that effort. Davis said preserving local black history is a way to show younger African-Americans that they are a part of a tradition. Jackson said setting an example for kids in nearby Coatesville is his primary motivation for drawing attention to the cemetery again. Coatesville, a struggling former steel city, is also home to the greatest concentration of impoverished people in Chester County. Nearly half of its residents are black. The cleanup slated for after the ceremony was postponed, said Jackson, until the last Sunday in April. Until then, the graves remain hidden beneath a carpet of dead leaves, choked in a snarl of brambles. Preservation isn’t just shovels and spades. Local historians have been compiling the stories of veterans and others buried in Derry Cemetery and listing them on genealogy websites for possible descendants to find.